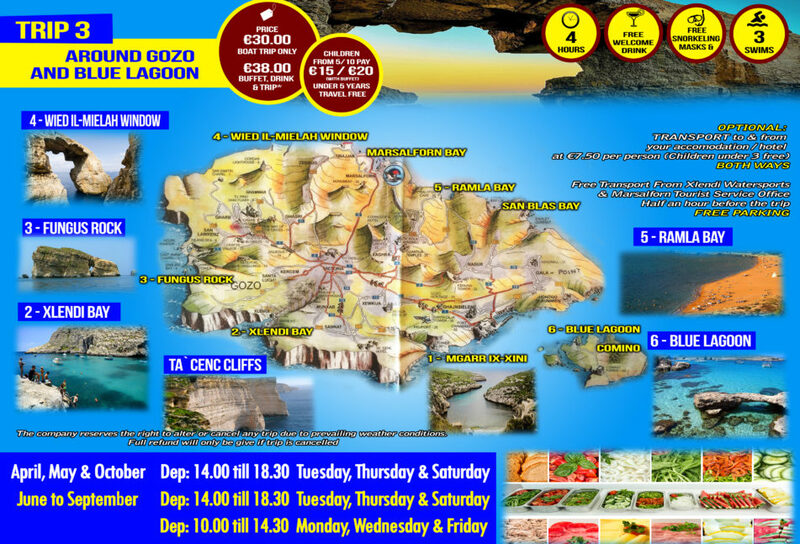 Gozo & Comino Trips - Xlendi Pleasure Cruises Ltd. 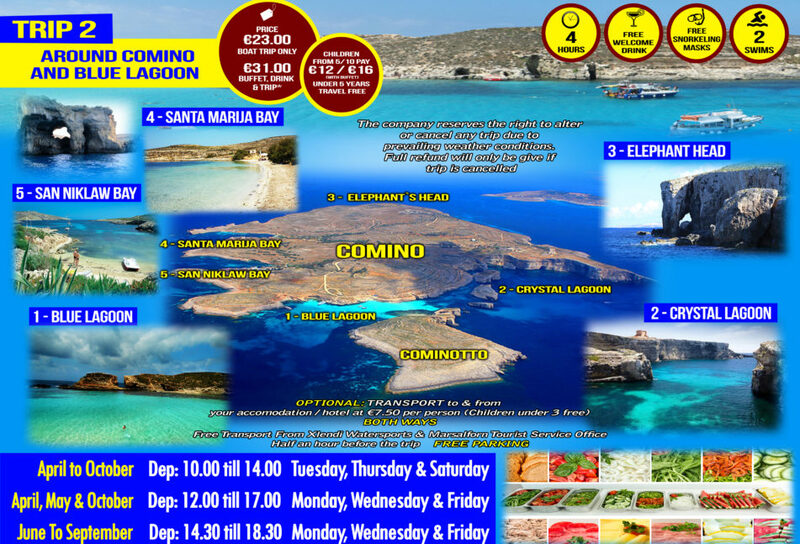 This boat trip will give you the opportunity to see the island of Comino. Our first stop will be at the Blue Lagoon. Here you will be able to explore the island, snorkel or swim in crystal water. Optional lunch will be served onboard. We continue around Comino, visiting Crystal lagoon where we stop to swim, snorkel and feed the fish. Then we crusie towards Comino Tower which was featured in the film ‘The Count of Monte Cristo’, the tuna farm and Elephant’s Point. 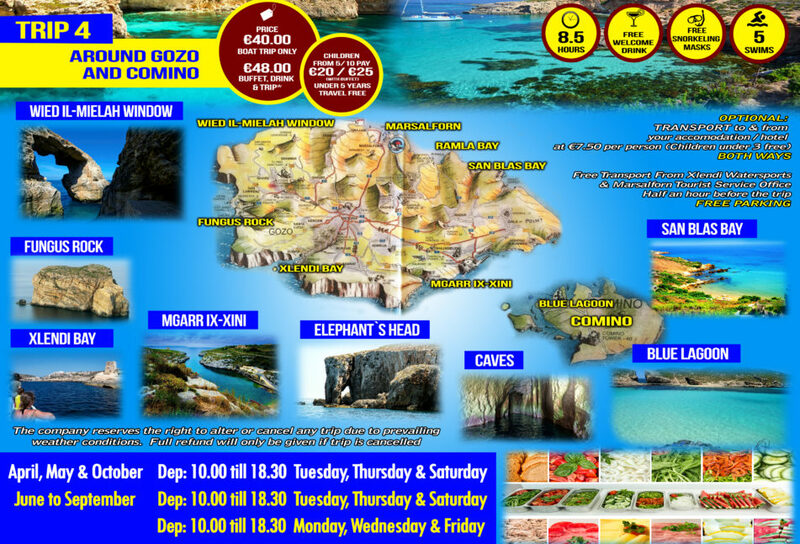 We continue by visiting Comino Caves, Santa Marija Bay and San Niklaw Bay. Afterwards we finish at Mgarr Harbour. Join us for a half day trip – cruising in comfort around the entire island, enjoying the breathtaking views of Gozo. We start by cruising towards Mgarr Ix-Xini, Ta’ Cenc Cliffs and Santa Katarina Cave. Our first stop is at Fungus Rock where you will have the opportunity to swim through the two conecting caves or simply snorkel in the stunning surroundings. We then cruise past the Azure Window, Ta’ Gurdan Lighthouse, Xwejni Bay, Qbajjar and the Salt Pans. Our second stop will be at the orange sand of Ramla Bay or San Blas (weather permitting) where you will have time to swim and snorkel. Passing by Dahlet Qorrot and Hondoq Bay. Stop at Blue Lagoon for our last swim before returning to the Harbour. The cruise really does have everything, exploring both Gozo and Comino. We start by cruisisng towards the island of Comino where we anchor at the Blue Lagoon, famous for its Crystal water. Here you are given plenty of time to sunbathe, swim and snorkel. You have the opportunity to get off at Blue Lagoon jetty where you can enjoy the beach, walk towards Comino Tower and enjoy the beautiful scenery of Gozo, Malta and Comino. At noon, a Gozitan buffet is served onboard. We continue cruising and then anchor at Crystal Lagoon, which is one of the best spots for snorkelling. We then cruise off passing Comino Tower and Elephant Point, followed by Comino Caves, Santa Marija Bay and San Niklaw Bay. Cruising out of Comino, we head towards the Gozitan Coastline, where we enter Mgarr ix-Xini Creek. We pass by Ta’ Cenc Cliffs and Xlendi Bay, where we visit Santa Katarina Cave. Anchoring at Dwejra, famous for its breathtaking scenery for another swim and snorkel while enjoying a spectacular view of Fungus Rock. Eyes open and cameras ready as we pass the Crocodile Rock, the Azure Window and the tunnel of the Inland Sea! The fourth call will be Ramla Bay or San Blas for swimming, they are both natural heritage sights. On our way back to Mgarr Harbour we make our final call back to the beautiful Blue Lagoon for a refreshing last swim. If the trip will not reach minimum of 30 pax the company reserves the right to charter trip on Xlendi 3. Should you like to enquire of any changing dates or any extra trips please call on 0035621559967. To confirm departure day please call at our office a day prior purchased trip. Keep in mind that Comino is bare land with blazing sun. On our boat you can make use of a number of facilities while having quality time enjoying the lagoons under a shade canopy. A sunbathing deck is also available on the boat. The Company reserves the right to alter or cancel any trip due to prevailing weather conditions. Full refund will only be given if a trip is cancelled.